What brought you into basketmaking? I first did basketmaking at school, like everyone in my generation. Think 1950s south of England girls’ convent school – I remember my entire childhood in black and white. We used the wood bases and wove with cane. I took it up again when I was teaching special needs children in South Africa in 1980. At the back of the cupboard were a load of those wooden bases and some old cane, so I got them out for the children and got into doing it myself. Then in 1982 I had come back to Scotland and was teaching young adults with learning difficulties and wanted to do a practical workshop with them. I went to a workshop with Bernard Graves at the Camphill School in Aberdeen to learn willow basket making. After that I bought books and went to lots of courses to learn more plus of course trial and error, more of the error actually! What do you most like about the craft? I like the endless variety of techniques and baskets. Yes the variety is the big appeal. I find such beauty in the plain simplicity of baskets. I also like that what we use to make baskets with, other people would probably just throw away. It is so satisfying to be able to make functional objects. How did you start to be interested in the historical side of basket making? I used to do a lot of demonstrating at shows and fairs. People would always come up and tell me stories. I also would be interested in what museums and stately homes had in their collections. At that stage you could still ‘touch’ that knowledge. But that’s almost gone now. My particular interest is in the fishing baskets of the East coast. I do love the shape of those frame baskets. I’ve done recreations of the Arbroath scull, rip and marlin and also the back creel of the Musselborough fishwives. Basket making has definitely enhanced my life. Rush. The English river rush is a beautiful material. 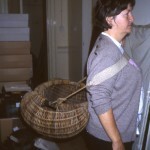 Is there anything you would still like to do in basketry? I love to learn a new technique and would like to make every kind of basket in the world! 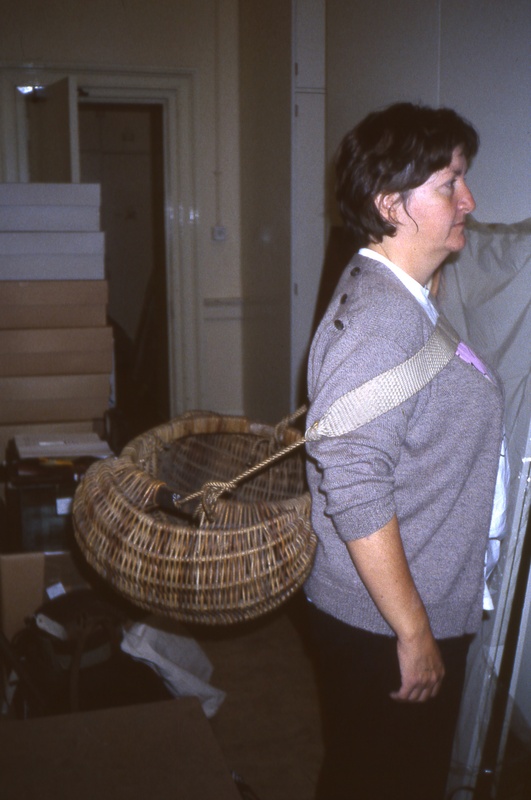 Liz Balfour was one of the founders of the Scottish Basketmakers Circle in 1988 and has come back to the committee in 2011. In 2013 she was the chair.